Advent is the time when Christians prepare their hearts for Christ's coming at Christmas. While the rest of the world jumps right from Thanksgiving to Christmas, Christians take the time to focus on what Christ's coming truly means. ​This Sunday is the final Sunday of the church year, the day we call "Christ the King". We end each church year by holding up our King Jesus. Jesus is our King. He is the ruler of heaven and earth. Yet, when he stood condemned before Pontius Pilate, he looked anything but a king. The message takes us through this strange confrontation between Jesus and Pilate as we look at what it means for us to call Jesus "king" and what it means for us to serve our king. ​God's people gather for worship tonight to give praise and thanksgiving to our Heavenly Father for all the many blessings we receive from him in our lives. Pastor Paul's message is based upon our readings for Thanksgiving, especially Psalm 100. He is holding up all the noises mentioned and illustrated in our lessons for Thanksgiving, showing how we can reflect them in the ways in which we give thanks to God. ​November begins with All Saints Day & ends in or near Advent, when we anticipate Christ's coming again. So the readings today tell of the final resurrection & the end time. In the turmoil of hope, fear & disbelief that these predictions provoke in us, Hebrews sounds a note of confident trust. Christ makes a way for us where there is no way & we walk it confidently, our hearts & bodies washed in baptismal water, trusting the one who has promised. The more we see the last day approaching, the more important it is to meet together to hear & share God's word of hope through Christ. Pastor Paul's sermon talks about how God gave skills and talents to the people of Israel to do the work of serving him. God does the same in our time. Time & Talents sheets were also reviewed and filled out during this time. ​Jesus states the core of God's law: love God with all you are & have & love your neighbor as yourself. The scribe agrees that Jesus has rightly identified the most important commandments, much more important than sacrifices. It can be difficult to know what to do but we just need to find the most loving thing we can do. Because Jesus has gifted us salvation, love can be at the center of all we do. This sermon is a "Thank You" to Martin Luther for all he continues to teach and demonstrate to us: the courage of individual faith, the power of God's grace, the importance of devotion to the Scriptures and the desire to care for the lives and faith of others. ​ Stewardship Message: "A Godly Habit"
​Nearly 2,000 years ago the first Christians in Greece were taking up an offering to help people they didn't personally know, the Christians living in Jerusalem. There was a famine in Judea and the Apostle Paul was collecting money to take there to help feed the members of the church. He instructed the Christians in Corinth to learn the godly habit of stewardship by setting aside money each Sunday so it would be ready for Paul to collect when he arrived. Stewardship is a godly habit. We all need to learn it and practice it regularly. As I said in last week's message, God doesn't deserve leftovers. God deserves our first-fruits. This week, as I talk about the collection in 1 Corinthians 16, and the delightful story of Zacchaeus in Luke 19, I will also hold up for you where the gifts from your godly habit of generous giving go and what they will do. "The Importance of Doing Our Part"
​This is the first of two Sundays where we discuss our personal financial stewardship to support the work of the church in 2019. The people of Grace have made a large increase in their giving to the church during our building program in these past three years. Next year the church council is proposing a modest budget increase. To achieve this, we all need to do our part and be as generous as we can when we give to the church. The text I am preaching on is from 1 Corinthians 12, where the Apostle Paul compares the church to a human body. Just as a body needs every part of it to do its job in order to be a healthy body, so the church needs all of its members to do their part to serve the Lord and to financially support the work of the church. ​In Mark 10:2-16, Jesus teaches his followers to look out for people in need. He describes why a man should not divorce a woman on a whim & encourages men & women to take their marriage commitment seriously. He is looking out for women because if they were divorced they would not be able to support themselves. Jesus also welcomes children, which was radical for his time. He even tells us to look to them as an example of faith. The sermon will explore how we can care for the vulnerable around us as Jesus taught us to do & as he does for us. ​We live in a society that prizes individual rights. The Bill of Rights guarantees specific rights to all citizens. The government cannot take these rights away. Rights are wonderful. But with rights also comes responsibilities. Jesus spoke a lot about responsibilities. Christians cannot live any way they want. They cannot declare that they are free to do whatever they choose to do. This week's Bible passages and Pastor Paul's sermon center in on living responsible Christian lives that take care of those whom Jesus calls the "little ones". This is a practical and important message for all of us. ​We are so happy to have Meg share God's word with us at and also talk about the important work being done by the Circle of Empowerment in Nicaragua. As our group of Grace volunteers prepared to go out & help others in God's name, the sermon text illustrates how we are to care for others. The two stories in the gospel show Jesus healing, in one case using his hands to do so. Jesus always went out of his way to help those in need. James 2 reminds us that we are to show no partiality when it comes to helping others. When we reach out to serve the lowly & those who truly need help, then we are fulfilling the "royal law" by keeping the Great Commandment (James 2:8). ​The gospel from Mark 7:24-37 shares two amazing stories of healing. Jesus has a conversation with a foreign woman who is begging him to heal her daughter. Then Jesus restores hearing to a deaf man. How do we treat outsiders? We are too often deaf to the cries of those in need. But Jesus shows us that God's healing is for people beyond the boarders this world creates. What does it mean to server the Lord? ​​At many points in the Bible, God's people make a choice to serve the Lord. Then they stray & God brings them back. In Joshua 24, Joshua calls God's people back to God & they commit again to serve God. The sermon will consider what it means for us to commit our lives in service to our God who has first loved & served us. ​Apparently not satisfied by Jesus' feeding of thousands, some who were there press him for a sign of his power; perhaps it is daily manna they want. As always in John's gospel when people want a sign, Jesus offers himself. He is the bread come from heaven to give life to the world. He calls us to come to him & believe in him & through that relationship to know the one who sent him. ​God chooses ordinary people to do very extraordinary & important things! Amos the Prophet & John the Baptist were called by God to bring God's word to his people & to prepare the world for Christ. How does God work through the ordinary in our lives today? ​Some of my most favorite stories are adoption stories. Hearing how families come together, with God's guidance & blessing, fills me with awe. The readings for Holy Trinity Sunday describe God's call to us through the Holy Spirit & Baptism. The sermon will look at what it means to be adopted as God's children in our baptisms. ​Life can throw some tough things our way-sickness, stress, wars, death, family issues...but God is greater than all of those things. We face them knowing that God is bigger than anything that can bring us down. We send our graduates out this week with this reminder & we take a moment to comfort our spirits knowing that God can handle anything life can do to us. ​In his great high-priestly prayer, Jesus asked his Father to be with his disciples as he prepared to leave them. Jesus' prayed that God would look after them, protect them, keep them unified as one & also keep them in the truth of his word. I will use Jesus' prayer as the basis of my Affirmation of Baptism sermon, asking that just as Jesus prayed for his disciples, so we pray that our confirmands will remain strong as a group of young Christians & continue to be made holy through the truth of God's word. ​What Does Love Look Like? ​This Sunday's image of the life the risen Christ shares with us is the image of friendship. We are called to service others as Jesus came to serve; but for John's gospel, the image of servanthood is too hierarchical, too distant, to capture the essence of like with Christ. Friendship captures the love, the joy, the deep mutuality of the relationship into which Christ invites us. The Greeks believed that true friends are willing to die for each other. This is the mutual love of Christian community commanded by Christ & enabled by the Spirit. ​The reading this week is 1 John 4:7-21. It describes the love God has for us & tells us that we know God when we love. The sermon will draw from passages throughout the Bible where God shows & tells us about God's love for us. Next week we will hear about what it looks like when we share God's love in the world. There are non-Christians who like to criticize Christians for simply accepting the story of our faith without any critical thinking about it on our part. They could not be further from the truth. From the very beginning of our faith, believers, like the Apostle Paul, asked the all-important questions, "What does it mean if we are right?" and "What does it mean if we are wrong?" when it comes to Jesus' resurrection. This week I have the honor of preaching on the all-important words of the Apostle Paul in 1 Corinthians 15, where he deals with these very questions. It's a message we all need to hear and think about when it comes to our own lives and faith. ​Each Easter season we hear the story of "Doubting Thomas" from John 20. Thomas was not with the rest of the disciples when Jesus appeared to them on Easter evening. He didn't believe Jesus had been raised from the dead and said that unless he could see him himself, and put his fingers in the wounds in Jesus' body, he would not believe. The author of John's gospel tells us that this story was recorded for us; for those who were not there that first Easter, those who did not see Jesus raised. This powerful story lets us know that we still can believe and still can have faith in Jesus. Yes, we really can believe this, even if we weren't there. ​In the story of the Exodus, Pharaoh is afflicted with a "hard heart". He will not listen to the Lord's command to free his people & sets his heart against the Lord, Moses & the Hebrew slaves. At times, in Exodus, the Lord hardens Pharaoh's heart in order to make him more stubborn so that God's victory over his will be more dynamic. At other times, Pharaoh hardens his own heart. (The Exodus 8 text has references to both) We can be guilty of hard hearts as well. That's what sin creates. Christians need to have a good "cardio workout plan" for spiritual health. Jesus sums this up when he talks about the love we have for God & our neighbors in the "Great Commandment". A healthy, loving heart takes work & effort but it is worth it. ​This week's sermon, part of our series to help you prepare for our church play on March 18, "Who Done In Mr. Z? ", is about Cain and Abel, the sons of Adam and Eve. Cain let sin come into his life and destroy his brother, his family and his own life. Jesus' words from Luke 12 teach us how we need to be on guard so that sin does not come into our lives to overwhelm us as well. ​The definition we use in confirmation for sin is "Sin is thinking you know better than God." Faith we define as "Trusting in God completely". In the play, we meet a much older Adam & Eve, who are living out the harsh reality caused by the fact that they listened to their own desires in the Garden of Eden & not to God's word. They thought they had a better grasp on the facts than God did & the beauty of the fruit & their desire to be wise led them to their foolish & sinful actions. On the flip side of this, God said, Jesus remained faithful to the Lord's word. In our lives we need to decide which voices we listen to; ours, the world's or God's. We begin Lent by returning our hearts to God. ​There are things in life we can easily understand & there are things that are beyond our understanding. The same is true in the Bible & in our faith in God. This week we hear about Elijah taken up to heaven & about Jesus being transfigured on a mountainside. Both things defy our understanding but what can we learn about God from them? ​Mark's gospel begins with a description of the whirlwind beginning of Jesus' ministry in Galilee. Talk about busy! Yet, in the middle of these incredibly days, Jesus made it a priority to find quiet prayer time to be with his Heavenly Father. His life and his schedule is a fitting example for us to follow in our lives; lives which seem so hectic and crazy so much of the time. We all have a lot to learn from Jesus. ​In Deuteronomy, God promises to raise up a prophet like Moses, who will speak for God; in Psalm 111, God shows the people the power of God's works. For the church, these are ways of pointing to the unique authority people sensed in Jesus' actions & words. We encounter that authority in God's words, around which we gather, the word that trumps any lesser spirit that would claim power over us, freeing us to follow Jesus. How does the word of God affect your life? How do your words affect others? We welcome Bishop Paul Erickson to preach on 1/21/18. Bishop Erickson is from the Greater Milwaukee Synod. ​God has a delightful way of acting in a fashion we would never consider. As the Prophet Isaiah says of the Lord, "My ways are not your ways". Jesus was not what most people were looking for in a Savior. When Nathanael saw Jesus he didn't have much good to say about him. Nathanael was in for a surprise. God also has a delightful way of using unlikely people . . . people like you and me . . . to serve him and do his will. Think God can't use you? Think again. You just might be surprised. 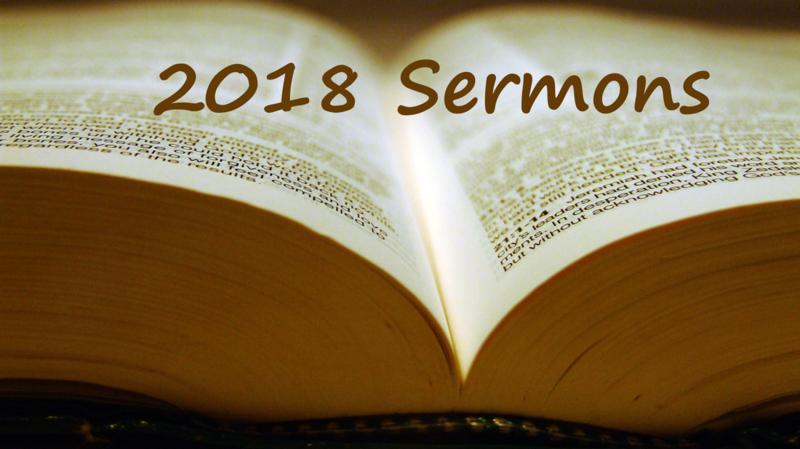 ​We welcome Pastor James Holmberg to preach on 1/7/18. He is the Director of Church Relations for Lutheran Social Services Foundation. Pastor Holmberg has served parishes in the Upper Peninsula of Michigan and Southern Wisconsin before accepting a call with LSS in 2011. Jim and his wife Marion live in Waukesha with three of their seven children.